1. Call or email describing your retractable canopy project. 2. Receive a quote via phone or email. 3. If the quote is acceptable, email digitals, dimensions, or a birds-eye-view diagram for accuracy and final price. 5. CableShade will email you the invoice for your order, or you can call in the payment. There are 3 standard sizes of fabric. After measuring and calculating your total square footage, determine which sizes you will need to cover the entire area desired. *NOTE: If standard sizes will not work, we can do custom sizes, with a 10% upcharge for customizing canopies. 84" Shades- Only available in select Sunbrella Solid colors (Forest Green; Captain Navy; Pacific Blue; Navy; Marine Blue; Cadet Grey; Burgundy; Toast; Black; Jockey Red; Heather Beige; True Brown; Charcoal Grey; Linen; Slate). Also available in most any Textilene fabric. of the 50" standard sizes (21 ft. width) would cost $15 per sq. ft.
 of the 64" standard sizes ( 21' 4" width) would cost $14 per sq. ft.
 of the 84" standard sizes (21 ft width) would cost $13 per sq. ft. The width measurement would determine whether to use standard sizes with standard pricing, or custom sizes with 10% upcharge. The 'projection' (back to front -- mounting point to mounting point) can be any increment and does not need to meet any custom size requirement. Often customers use a combination of sizes AND/OR a combination of colors (i.e. Stripe/Solid/Stripe, etc) to achieve the best price available AND/OR create the most decorative look for their project. Hangdowns are $30 additional--each ($40 on 84" sizes). Required on the back side only, for snow areas. Hangdowns usually 12-16 inches. *Prices do not include shipping and handling charges or taxes, if applicable. Prices do not include the pergola or frame structure. Prices quoted are for assembled canopies and all required hardware for installation. Shipping costs vary depending on location. 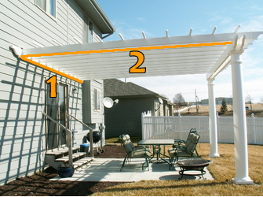 Price does not include frame/pergola. 16 x 12 = 192 sq. ft.
* Installation available in some areas. Average install price of $100 per canopy depending on distance and seasonal availability. Approximately 90 % of the CableShade customers do their own installation -- simply set the 4-corner eyelets where instructed, thread the cable and tighten the turnbuckle (all provided). Email to: len@cableshade.com along with your name, city, and best contact phone number.